The Taycan could get some competition from within the family. The extended Porsche family and the companies it controls have produced no shortage of sports cars over the decades. This is the latest, and while the brand is new, it's from a name we know. The Piëch Mark Zero is an electric sports car with classic proportions and a modular architecture that could make it the first iteration of a range of vehicles to follow. That is, if it gets off the ground. But the clout of its name alone could yield better fortunes than so many other startups that have come and gone. The Mark Zero is the work of one Anton Piëch, son of former Volkswagen Group chairman Ferdinand Piëch and great-grandson of Ferdinand Porsche (founder of the eponymous automaker and father of the VW Beetle). While the family hails from Austria and its automakers from Germany, this one's from Switzerland – and that's where it'll be unveiled, at the 2019 Geneva Motor Show that's now just weeks away from opening. Details at this early stage are pretty slim, but we like what we're seeing so far. From the few renderings released, the design looks to blend a classic shape with modern touches. 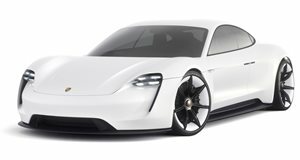 The vehicle is earmarked to provide an electric range of about 310 miles, with a curb weight of less than 4,000 pounds – a fair bit heftier than the new Porsche 992, but lighter than, say, a Tesla Model S... or Porsche Taycan. Its air-cooled battery pack is said to be mounted within the transmission tunnel and on the rear axle, and the modular construction is designed to accommodate future upgrades and even other powertrain options – including internal-combustion engines, hybrid systems, and even hydrogen fuel cells. And more body-styles are planned to follow, including a four-door sedan and a crossover.